Some of you will think I've lost my marbles after actually taking a gander at the box art in question, I'm sure, but I'll stand by my assertion in the header until the bitter end. I think. I mean, you can't deny that the cover art below--created for the Japanese 3DS remake of Dragon Quest Monsters 2, which hits Japanese store shelves alongside an awesome 3DS LL on Feb. 6--is fabulously colorful. Nor can you deny that the character illustrations featured on said cover art are anything less than adorably compelling. If you were to tell me you thought the game's logo sucked or was a bit too wordy, though, I'd totally agree with you. Also, it blends in a bit too much with the art behind it, if you ask me. Still, I like it, and I hope it eventually finds its way across the pond to our shores--although we all know that's about as likely as Slime MoriMori Dragon Quest 3: Taikaizoku to Shippo Dan making it over here. 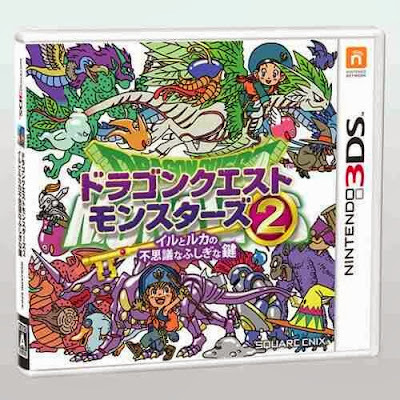 Speaking of which, the Japanese 3DS tumblog recently published a post that showcases the cox art created for all of the Dragon Quest games that have been released for the Japanese 3DS so far. Check it out here. Sorry, no "real" post today. It's my birthday! The day's already off to a great start, by the way, as one of the presents my parents sent me was a copy of Monster Hunter 3 Ultimate, a game I've been admiring at a distance for some time now. 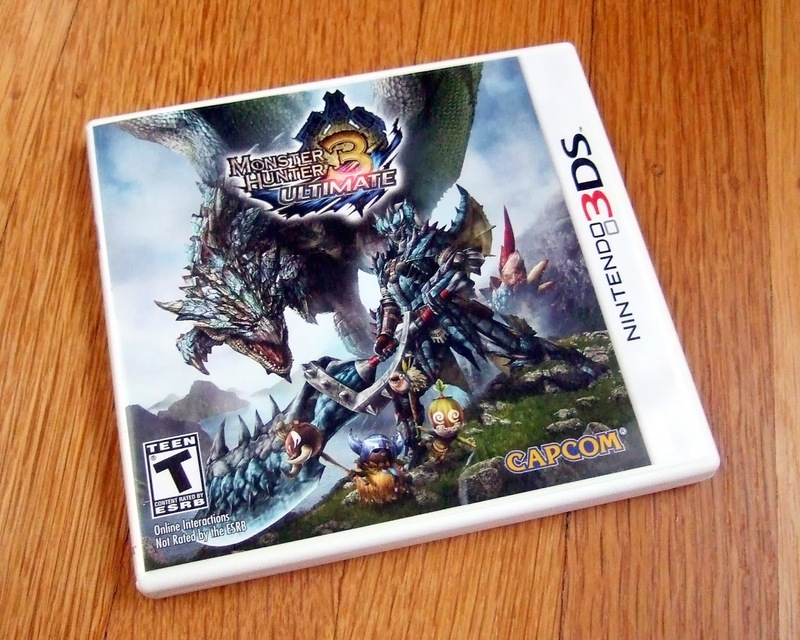 While I wait for them to arrive, I'll do my best to put Monster Hunter 3 Ultimate through its paces--although maybe I should finally pick up a digital copy of Culty's Monster Hunter Beginner's Guide before I jump in. Remember how I posited in this recent post that the GameBoy version of Dig Dug never saw the light of day in the Land of the Rising Sun? 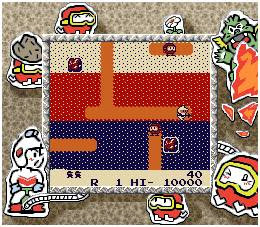 Thanks to a helpful bit of cyber-sleuthing conducted by my Twitter pal Brian (aka iamnotagoomba, aka the guy behind the Japanese 3DS tumblog), I now know that the GameBoy version of Dig Dug was released in Japan--just not as a stand-alone title like it was elsewhere. Instead, it was included on the second of the three Namco Gallery games that hit Japanese store shelves back in 1996 and 1997. Each of these portable compilations contained four titles. The first Namco Gallery featured ports of Battle City, Galaga, Mappy and Namco Classic (a golf sim). The second included Dig Dug, Famista 4 (baseball), Galaxian and The Tower of Druaga. The third, Family Tennis, Jantaku Boy (mahjong), Sky Kid and Tower of Babel. 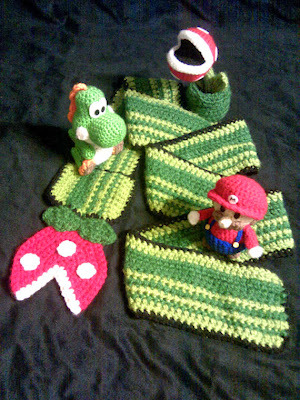 The fascinating thing about these ports is that although they're pint-sized--not to mention black-and-white, or rather green-and-white--versions of their arcade and console counterparts, they look and sound and play as much like the "real deals" as is possible given the hardware. That's even more true when you stick one of the Namco Gallery carts into a Super GameBoy peripheral, as doing so injects each game with various amounts of color while also surrounding them with some pretty fabulous borders (see the screenshots placed throughout this post for evidence). After dabbling with each of them over the last few days, my favorite so far is the second release--thanks mostly to the "New Dig Dug" mode that's included in Dig Dug. 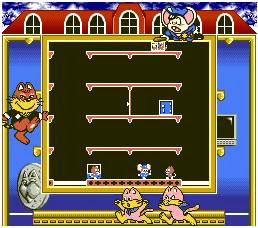 The others are nice, too, though; especially the colorized versions of Galaga, Mappy (above) and Sky Kid. Would you believe that I completely forgot that the folks at Atlus were supposed to make an announcement related to the Persona series yesterday until I woke up, checked NeoGAF and saw the news that Persona 5 will be released for the PS3 sometime next winter? Granted, that the company's main announcement would revolve around both Persona 5 and the PS3 enter "foregone conclusion" territory long ago, so that may have had something to do with it. As surprising--and strange--as Persona Q's reveal was for most of the Interwebs, the following reveal was even more so. Yes, the trailer above really is for a Persona-based rhythm game, called Persona 4: Dancing All Night, that's being made by the same folks (Dingo) who brought the world the Hatsune Miku PSP titles. Oh, and it'll be released for the Vita--again, in Japan--next autumn. I don't know about you, but I'll certainly be picking up some version of Persona Q next year. Should I add a Vita to my collection in 2014, I'll likely also buy a copy of Dancing All Night, as it looks and sounds far too wacky and wonderful to pass up if given the chance. Are any of you planning to purchase any of the games mentioned throughout this post? If so, which ones--and why?